Tremella – The Beauty Mushroom! Tremella mushroom (Tremella fuciformis) is one of the great superfood mushrooms and longevity tonics in Traditional Chinese medicine (TCM). Tremella has traditionally been used throughout Asia as a Chi (Qi) tonic, immune modulator, brain supporter, and beauty enhancer. 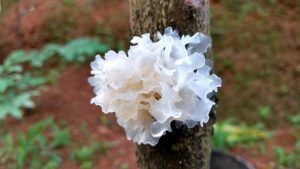 Tremella fuciformis also called “Silver Ear mushroom” and “snow fungus”, is an incredible youth-preserving mushroom that has the ability to rejuvenate and moisturise the skin naturally. Tremella contains unique polysaccharide compounds that show remarkable water retaining properties. Its water holding capacity is nearly 500 times its own weight. This makes Tremella one of the best natural hydrating ingredients, better than hyaluronic acid. Tremella’s polysaccharides also stimulate the production of superoxide dismutase (SOD) in the brain and liver. SOD is one of the most important antioxidant enzymes in the body that also helps to protect and regenerate the skin. Tremella’s potent skin and beauty benefits are often used in premium skincare brands including in anti-aging moisturisers, serums, and face masks to improve the health and appearance of the skin. Try adding Tremella mushroom topically to your own beauty and skin care routine. * Semi-wild organically cultivated Tremella mushroom (Tremella fuciformis) fruiting body. No added grains, fillers, starch, or mycelium. We recommend starting with 1/2 tsp (1.7g) per day. If you are sensitive to herbs, you may want to start with 1/4 tsp. When your body feels ready, you can increase your dosage according to your daily needs. This extract is not heat sensitive.